Visitation - getting in the homes of kids, is the best way to get to know the kids in your ministry. A child bedroom is a laboratory of a child's interests. If you want to understand a child, visit their bedroom - it is a diorama of their of their heart. Visitation Prize! You visit the winner of a contest! Ask to see their room. Talk about what they have. THE RESULTS If you get into the homes of the kids you minister to, then you are truly engaging in effective relational ministry. It will give you greater insight into the interests and needs of kids, and endear them to you so that they are more eager and ready to receive instruction from you. Ever had a really good friend who had never been to your house? Didn’t think so. If you want to be their friend, you’ve got to get over to their house. BONUS DOWNLOAD: Here is the PDF excerpt from The Kidology Handbook "Getting Into the Home" (487k). 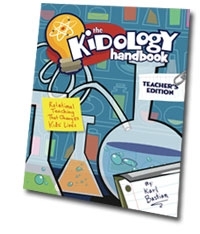 Get the FULL 143 Page Kidology Handbook on CD-ROM or Download. KIDMIN WINNER! Our winner this week is Jackie McCallister for suggesting Vomit, while it wasn't the right answer, it made me laugh! (What Kidmin worker/leader hasn't had to deal with that Kidmin Keyword? LOL) She wins a FREE copy of The Kidology Handbook! WANT TO BE A WINNER? Submit your guess or suggestion for next week's Kidmin Talk Key Word for the letter "W" - by E-mail, Forum, or Twitter.